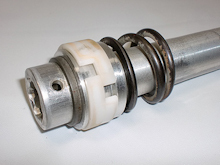 Look for your style damping rod and follow the links for Emulator installation. This is the most common type of damping rod on Japanese KYB and Showa forks from the early 70s to present. The top of this damping rod is cupped. It may be round (top) or have a hex (middle) or a double hex (bottom). The hex is for a Damping Rod Holding Tool. 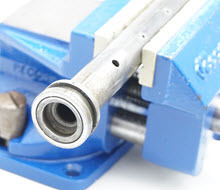 A universal Damping Rod Holding Tool is available (TFDH 01). Emulators are designed to sit in the cup on top of these damping rods. The fit does not have to be exact. The requirement is that the Emulator must cover the top opening of the damping rod completely. Move it over to the side to check for gaps. The main fork spring holds the Emulator in place. The only other requirement is the existing compression holes (on the bottom of the rod) must be enlarged and/or added to. The new holes should be located above the existing holes. The exact size of the holes is not important. It must have enough area to transfer control of the damping over to the Emulator. This is a difficult installation that requires brazing. This can be performed at Race Tech if you'd prefer. 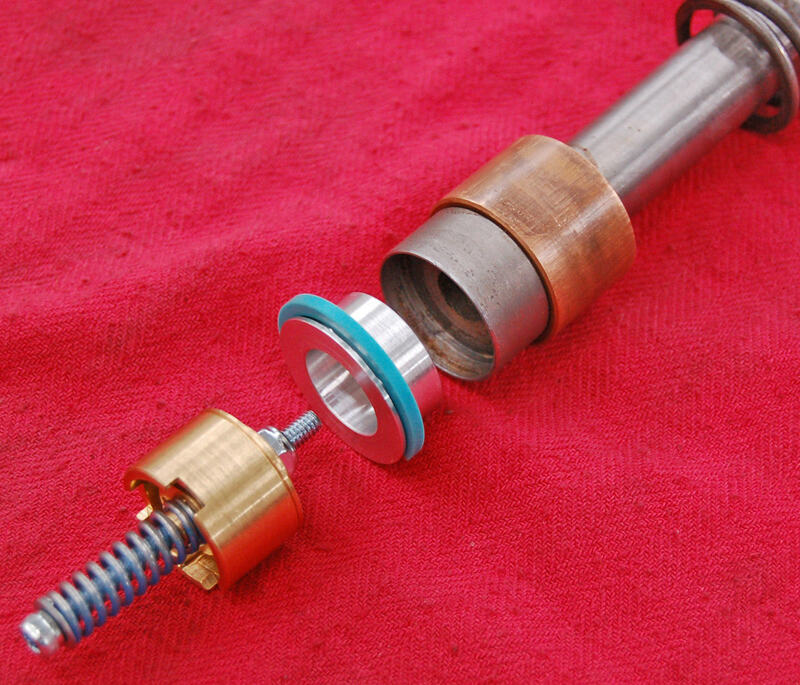 The RZ has a unique "twin tube" damping rod that must be modified for proper damping. The inner tube must be removed and the stock rebound feed holes must be brazed and re-drilled. Notice the ID of the damping rod. This is the inner tube that is press fit into the outer tube. Type 2 - Non-Cupped Top (i.e. Flat-Top or Protruding-Top). These are similar to Type 1 but there is a boss protruding above the piston at the top of the damping rod. This style fork require adapters. Emulator Adapters may be included in the Emulator Kit, in some cases they must be purchased separately or you can fabricate your own if you have a lathe. See the Product Search for applications. Found on European dirt and street bikes with Marzocchi Forks, These include Ducati, Laverda, Can-Am, etc. 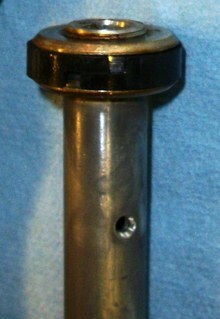 38mm Marzocchi shown. See Type 2-1 below for details. These forks have a check ball inside the rod top that must be removed. Emulator Adapters are required. Stock Piston Rings should be replaced with Race Tech Piston Rings. RT Hi-Performance Fork Springs are required as stock springs are too long and soft. 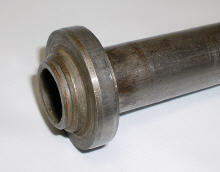 This damping rod requires machining. This general style is found on many early to late 70s KYB 34-36mm forks. See also Type 2-10 KYB 34-38mm 1976-78 as they are very similar. This fork has a check ball with spring inside the bottom that must be removed. The top of the rod must be cut off at the chamfer just below the outlet holes (below the top hex). The FEGV S3301 Emulator Kit requires you to make 30mm tall 3/4" PVC Adapters (see Details). The (8) existing compression holes should be drilled out to 6mm (1/4"). It is fine to maintain the existing hole pattern even though it is different than the Emulator Kit instructions in regard to orientation of the compression holes. Maintain the stock hole pattern and simply enlarge the existing holes. NOTE! 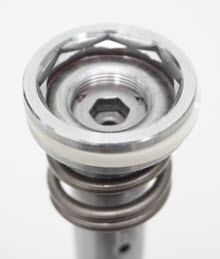 Race Tech Fork Springs are required for all BMW Gold Valve installations (see Product Search). This BMW fork has a flat top requiring an Emulator Adapter. The Piston Ring is thin and flat similar to a Shock Piston Ring. 36mm Forks use FEGV S3301 Emulators with FPEV AD3301 P Adapters. 38mm Forks use FEGV S3501 Emulators with FPEV AD3507 P Adapters. 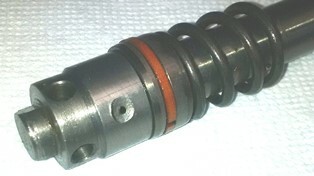 The Bottom-out Cone on the bottom of the Damping Rod is threaded on. The rest of the installation is standard per the Emulator Kit instructions. A total of (6) Compression holes should be drilled, 6mm (1/4") for 36mm forks, 8mm (5/16") for 38mm forks. Found on Triumph and BSA 500-750cc street as well as Scrambler models early to mid 1970s. The Hex shaped portion at the top of the rod must be removed and discarded. It un-screws from the main rod. The piston assembly should then be tightened and Loctited back onto the rod. The FEGV S3301 Emulator Kit used for these forks requires custom made 20-25mm tall 3/4" PVC Adapters. It is recommended to replace the stock o-ring with Race Tech Piston Rings FPPR Series. At a minimum, install a new o-ring as every one we've seen is worn out. There is typically a slot rather than compression holes at the base of these damping rods. The slot is maintained but supplemented by quantity (6) holes, 6mm (1/4") drilled 90 degrees from the stock slot. Note that Fork Spring length is critical on these models! Stock springs cannot be used, Race Tech springs are a must! Check your stock spring length for comparison. 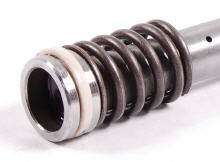 RT springs are 425mm long. Room must be allowed for 30-40mm combined height of the Emulator and Adapter. Custom FRSP 2550 series Fork Springs can be made if needed at the length and rate required. Alternate style found on Triumph and BSA 500-750cc street as well as Scrambler models mid to late 1970s. 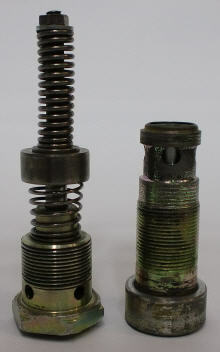 The Top Nut and Screw assembly threaded onto the rod must be removed and discarded. It un-screws from the main rod. The piston assembly should then be tightened and Loctited back onto the rod. The FEGV S3301 Emulator Kit used for these forks requires custom 20-25mm tall 3/4" PVC Adapters to replace the top nut. The modification is basically the same as Type 2-5 early models. It is recommended to replace the stock o-ring with Race Tech Piston Rings FPPR Series. At a minimum install a new o-ring. There are slots on each side of the rod, 1 upper and one lower rather than compression holes at the base of these damping rods. These slots are maintained but supplemented by quantity 6 holes, 6mm (1/4") drilled 90 degrees from the stock slots. Note that Fork Spring length is critical on these models! Stock springs cannot be used, Race Tech springs are a must! Check your stock spring length for comparison. Race Tech springs are 425mm long. Clearance must be allowed for 30-40mm combined height of the Emulator and Adapter. Custom Fork Springs can be made if needed. These forks are really harsh and WAY undersprung. To their credit and unlike many later models they do have a check valve in the bottom of the inner fork tube. The 1972s have solid steel Piston Rings that do a poor job of sealing the rebound chamber. They require fairly extensive modification and machining. They are "RT Only", meaning, we do these mods to the damping rods at Race Tech ONLY. These forks are notorious for being really harsh and are also way undersprung. They have no check valve in the bottom of the inner fork tube and fill the rebound chamber from the top, past the damping rod head. They require special adapters and slightly smaller Emulators than you might think. The 1973-74 models have solid steel Piston Rings. These piston rings have a horrible time "attempting" to fill the rebound chamber. They require extensive machining to fit 1975 style piston rings. The top-out spring is also modified. This makes them "RT Only", meaning, we do these mods to the damping rods at Race Tech ONLY. See Type 2-7-1 for a basic explanation. 1975 and later forks have plastic Piston Rings. When working properly, these piston rings fill the rebound chamber adequately. However, it is common for the Piston Rings to wear out and/or break. These fork mods are much simpiler than 1972-74. They have hydraulic top-out and do not have top-out springs. The Head of the Damping Rod is brazed on so there is no flat surface for the Emulator Adapter to sit. This one requires machining. This is a common Marzocchi 40mm fork. Notice the holes on the right side of the rod. There is also a plastic floating ball inside the damping rod that must be removed. These forks require machining with a lathe. These models are a later variation of Type 2-2 noted above. The stock damping rod has a piston band but it doesn't seal well, even when new. Also you can't buy original replacements any more. Therefore this model falls into two categories. It is also a Type 3 (no piston ring). 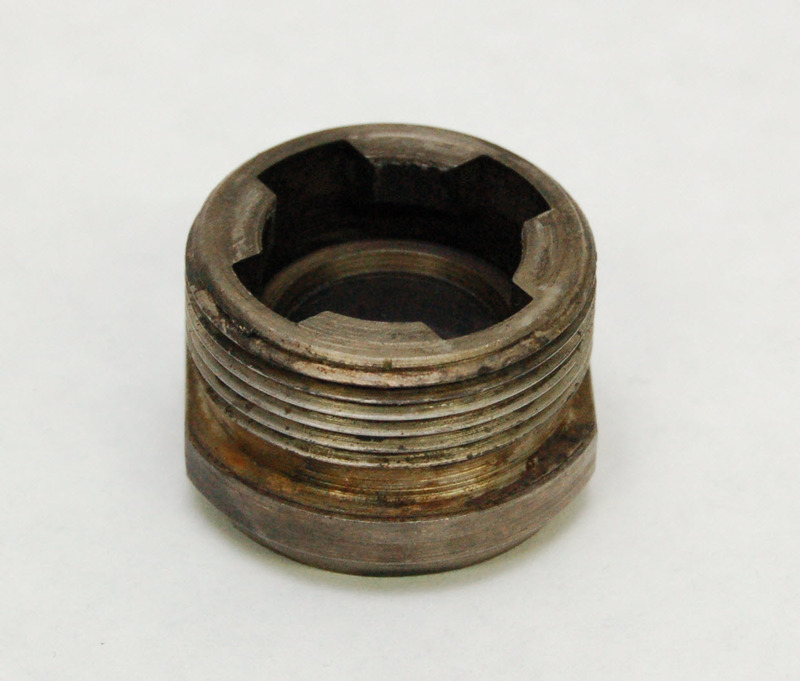 Our adapters may have a piston ring built in. Common on Japanese and European dirt and street bikes in the 60s and early 70s. 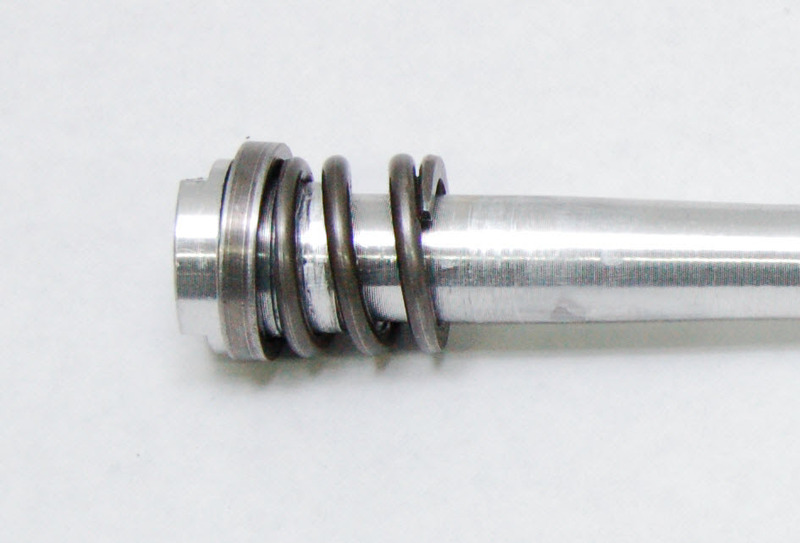 Similar to Type1 but the damping rod does not have a piston ring. This makes the damping inconsistent and it decreases over time. To remedy this, Emulator Adapters with built-in Piston Rings are available. They are included in some Emulator Kits or else they must be purchased separately. See Product Search. Ceriani Style 35mm Penton MX Forks (similar to CZ 250) shown with FEGV 2901 and FPEV AD2903 P Adapters. The top of Betor and Bultaco 35mm Damping Rods is very tall. Also there is no piston ring. FPEV AD3302 P Adapters with piston rings solve both of these issues. Adapters with piston rings are included in Emulator Kits for Betor and Bultaco Forks. 35mm Betor forks are common on European Dirt and Street Models 1970-80. Common applications are: Aermacchi, Bultaco, Ducati, many European applications. FPEV AD3302 P Adapters with piston rings are also sold separately if needed. Ceriani 32 - 38mm Damping Rods are flat top style with no piston rings. These require adapters with piston rings that are included in Emulator Kits. FPEV AD3804 P adapters (pair) along wtih FEGV S3801 Gold Valves for Ceriani 38mm Forks. FPEV AD3004 P, FPEV AD3303 P, Adapters with piston rings included in Ceriani Fork Emulator Kit and also sold separately. FPEV AD3804 P for 38mm is sold seperatley from Gold Valve Kit. These forks are common on many European Dirt and Street Models 1970-80 as well as Ceriani and Paoli aftermarket forks from the 1970s on. This style fork is also stock on some European models. These forks were the standard for Harley on 41.25mm forks from 1949 thru the 60s. The Head of the Damping Rod has no piston ring and protrudes as well. This requires an adapter with a piston ring built in. If you take the clip out of the bottom of the fork tube it will look like the image at the bottom. The Check Valve mechanism is very restrictive and requires an updated design. We have provided drawings if you want to make them yourself or you can have us do the work. Found on some Japanese dirt bikes in the early to mid 80s. These are just like Type 1 but the bottom damping rod bolt has a valve built into it. This valve is called a Linear Valve. Sometimes this valve is adjustable with a screw on the bottom, sometimes fixed. The Linear Valve must be disabled so it doesn't add to the damping created by the Emulator. These can have Non-cupped (flat-top or protruding) as well as standard cupped-top. Found on some Japanese street bikes from the early 80s onward. These are Type 1 Cupped-Top or Type 2 Flat-Top but there is an additional Anti-Dive valve near the bottom of the fork. 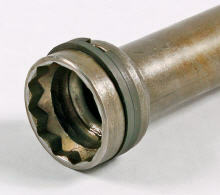 The Anti-Dive valve is typically bolted onto the outside of the fork. There is either a brake line, electric wiring, or the actual brake caliper attached to the Anti-Dive Mechanism on the fork slider. These forks have an external Anti-Dive Valve Mechanism with a brake line or electric wiring attached. Found on KYB 36, 37, 38, and 40mm forks from the early 80s. These are just like Type 1 with standard cupped-top. 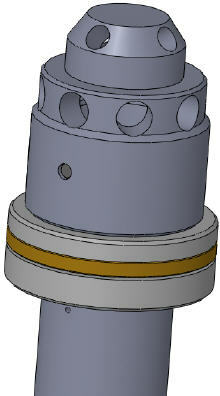 However the damping rod is stepped at the bottom for the Anti-Dive by-pass with the compression holes hidden inside the bottom stop cone. This system requires the fork oil to travel thru the Anti-Dive mechanism before it reaches the compression holes. The Anti-Dive Valve must be by-passed. This is done by adding the additional compression holes just above the step and bottoming cone so that fork oil can reach the compression holes without first having to move thru the Anti-Dive unit. Compression hole modification locations are crucial. The additional compression holes required for Emulators must be drilled just above the step at bottom of the Rod. One of the variations found on Honda street bikes from the 80s onward. These forks are identified with the word "TRAC" on the fork slider. This has a mechanically actuated Anti-Dive. The actuator is on the outside of the fork attached to the brake caliper. With this modification the Anit-Dive will be disabled internally. This style can be either a Type 1 (cupped-top) or Type 2 (non-cupped-top). The damping rod on the TRAC leg has a check valve. Some Showa 41mm forks also have a rebound damping adjuster on one leg. This adjuster will be disabled. 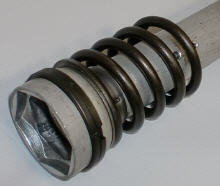 The Showa Damping Rod pictured is from a Honda V65/VF1100S Sabre or Magna with 41mm TRAC Forks. This style is also found on Interceptor models thru the late 80s as well as GL1200-1800 Gold Wings. Found on Honda street bikes from the early 80s typically along with TRAC Anti-Dive Forks. These models have one leg with the TRAC unit while the other leg has a Rebound Damping Adjuster on the Fork Cap. There is a "D" shaped rod running from the fork cap into the top of the damping rod. 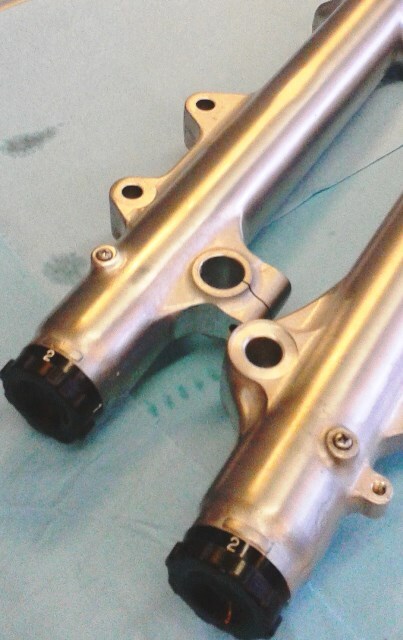 Showa 37, 39, 41 and 45mm Honda forks require removing the rebound damping adjuster mechanism. 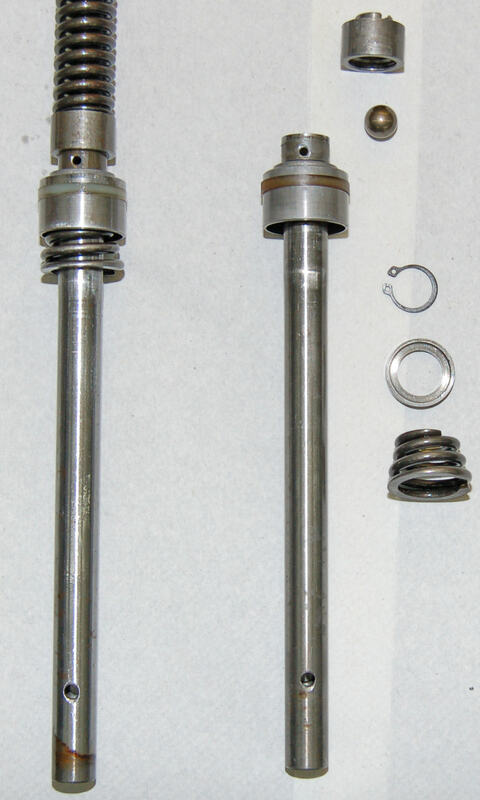 The Showa Damping Rod pictured is from a Honda V65/VF1100S Sabre or Magna with 41mm TRAC Forks. This style also found on Interceptor Models thru the late 80s. Standard Honda Street bikes with anti-dive and cupped top. 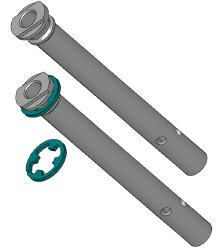 Forks with external rebound adjusters require special treatment which involves disabling the external adjustment. After this procedure you will no longer have external rebound adjustment. These forks have an external Rebound Adjustment. Found on KYB 37mm forks from the early to mid 80s. The damping rod has an internal, 4 position Rebound Damping Adjustment that can be retained with the Gold Valve Emulator Installation. These forks may also have a Preload Adjustable Fork cap. Damping Rod assembly and clocking (rotational alignment) is critical to maintain proper operation and adjustment of the Rebound Damping Control. Moto Guzzi California and other Guzzi models with 45mm Sachs forks have a check valve built into the head of the damping rod. This makes them very harsh. NOTE: Before you begin!!!! These forks appear to be very well made but very poorly designed. UNLESS YOU ABSOLUTELY HAVE TO, DO NOT SPLIT THE FORK TUBES!